The Uttar Pradesh had on Monday ordered multiple probes by SIT, ADG-Intelligence and a magisterial inquiry into the case. 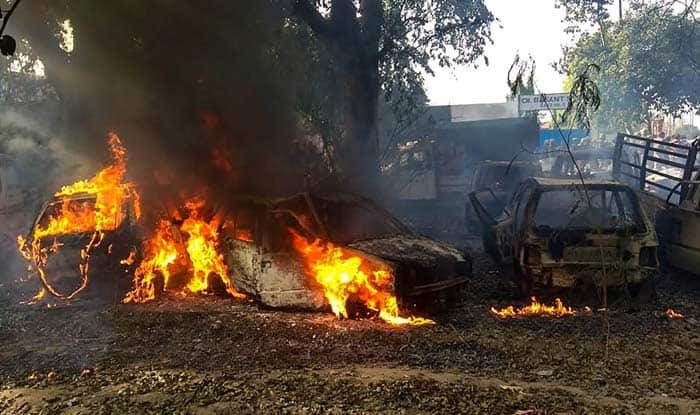 Bulandshahr: Four persons were arrested and at least four others detained for their alleged involvement in mob violence that broke out after cow carcasses were found strewn in a jungle, killing a police inspector and a passer-by, police said Tuesday, as angry and tearful families prepared for the last rites. Addressing a press conference, Anand Kumar, ADG Uttar Pradesh Law & Order, said, “Four people have been arrested. I don’t know about the organisations yet, but the main accused in the violence is Yogesh Raj who has not been arrested till now”. Bajrang Dal leader Yogesh Raj, a Bajrang Dal leader, has been named as the prime accused in the FIR lodged by the police in connection with the violence that took place on Monday. It is also reported that Raj led the violent mob which allegedly attacked the police team and killed Inspector Singh. Interestingly, Yogesh — the main accused in the police FIR — has himself filed a separate complaint of illegal cow slaughter. Kumar assured that the culprits will not be spared, adding that six probe teams have been formed to investigate the matter. Also, an SIT has been formed to investigate the matter, he added. “It would be premature to say it was an intelligence failure or failure of any other agency. No action will be taken against any policeman till probe is complete,” Kumar said. As police continued their investigations, emotions ran high in the area with Singh’s body, draped in the tricolour, being prepared for last rites. Earlier today, the police lodged two FIRs in connection with the case. One FIR has been registered against the alleged cattle slaughter and the other one has been lodged against the violent protests that followed. A total of 27 people, including Bajrang Dal leader Yogesh Raj, have been named in the FIR against violent protests. 60 unnamed people have also been mentioned in the FIR. Senior Superintendent of Police (SSP), Bulandshahr, Krishna B Singh said police were probing the matter and raids were being conducted to arrest the other accused. The accused have been booked under Indian Penal Code sections 147, 148, 149 (related to rioting), 332 (voluntarily causing hurt to deter public servant from his duty), 353 (assault or criminal force to deter public servant from discharge of his duty), 341 (wrongful restraint), 302 (murder), 307 (murder attempt), 436 (mischief by fire or explosive substance with intent to destroy house), among others. • Three accused have been sent to judicial custody of 14 days by District Court. Main accused Yogesh Raj, a Bajrang Dal activist still absconding. • National Human Rights Commission of India (NHRC) issued notice to the Government of Uttar Pradesh over reports the killings. The commission, in the notices, has observed that it is “indicative of yet another incident of violent protest and rampaging by an unruly mob, exposing lawlessness and failure of the administration to tackle sensitive issues and situations”. • CM Yogi Adityanath has called for a meeting with officials today at 8:30 PM at his residence, over law and order situation in the state. • He worked with utter honesty and took all the responsibility on himself. This is not the first incident, he had bullet injury twice before. But now nobody is giving him justice. Justice will be done only if his killers are killed, said widow of slain policeman Subodh Singh. • Family and police department pay last tributes to the Police Inspector Subodh Singh (who died after being attacked by people protesting over alleged cow slaughter) at his residence in Etah. • “My brother was investigating Akhlaq case and that is why he was killed, its a conspiracy by Police. He should be declared martyr and memorial should be built. We do not want money. CM only keeps saying cow cow cow,” says Subodh Kumar’s sister. • “It’s a shocking state of affairs how a mob killed a police officer investigating the Akhlaq case. Who gives these people the authority to take law in their hands? Instead of taking care of his state Yogi is going to Telangana and spewing venom,” says Kapil Sibal. • “Two people have been taken to custody. A Special Investigation Team (SIT) has been formed to investigate why the violence happened and why the police personnel left Inspector Subodh Kumar alone,” ANI quoted Prashant Kumar, ADG Meerut Zone, as saying. • “My father wanted me to be a good citizen who doesn’t incite violence in society in the name of religion. Today my father lost his life in this Hindu-Muslim dispute, tomorrow whose father will lose his life?” says Abhishek, son of deceased Inspector Subodh Kumar Singh. • Initial investigation confirmed that Inspector Singh and 20-year-old Sumit died of gunshot injuries. The autopsy report of the SHO revealed that he was shot in the head with a local-made .32 bore pistol. • Reacting to the incident, Samajwadi Party leader Azam Khan said that the police should find out who brought the animal carcass there, claiming that there is no minority population in that particular area. • Giving details about the incident, Sub Inspector Suresh Kumar, an eyewitness in the incident who accompanied Singh, said that around 300-500 people attacked the entire police team present at the spot. Trouble started on Monday morning when carcasses of the cows were found dumped in a forest area outside Mahaw village. Activists of right-wing organisations soon gathered at the spot and alleged that people of a community were indulging in cow slaughter. Angry villagers and members of various Hindu groups brought the animal remains in a tractor-trolley to the Chingarwathi Police Chowki and demanded action against the culprits. They raised slogans against the police administration and blocked the Bulandshahr-Garh State Highway. Bulandshahr District Magistrate Anuj Kumar Jha, Sub-divisional Magistrate Avinash Kumar Maurya and other senior officials tried to reason with the protestors but they refused to budge. The protesters soon turned violent, pelting stones on policemen and indulging in arson, Jha said.